Hi, earlier in our codeigniter tutorial series, I have discussed about integrating bootstrap styles with codeigniter pagination library. And I got enquires from readers about adding search filter to it. Including search option to pagination results will greatly improve user experience, especially if you have several hundreds of pages to skim through. 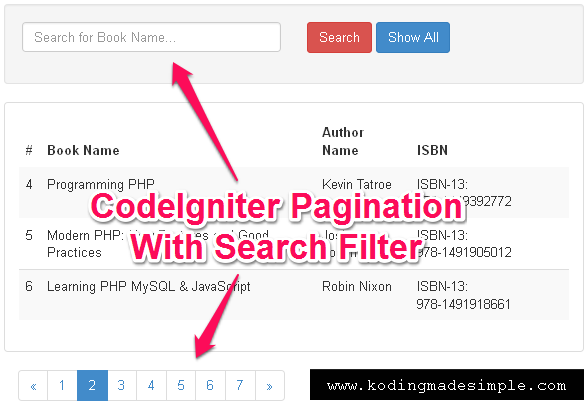 So in this post I will teach you exactly how to implement search query feature in codeigniter-bootstrap pagination. To implement pagination with search, we need to retrieve a large data set from the database, display in chunks and add a search form on top to filter those results. For better understanding, let me go by an example and explain it with a sample database. Run this below sql commands in mysql to create the database ‘db_library’ with a table ‘tbl_books’ that stores details of books. Having the database structure in place, let’s move on to the coding part. First we need a codeigniter model file to place all our database transactions. For this example, we have to write two methods in the model for 1. To fetch the list of all books from the table ‘tbl_books’ and, 2. To get the number of books returned from ‘tbl_books’ for a particular search query. Now create a file named ‘pagination_model.php’ inside ‘application/models’ folder and copy paste the below code to it. Next we have to create a controller file for pagination and load codeigniter’s basic set of helpers & libraries, along with pagination library and the model we have created above. In the controller we need two methods, one the index() method, and the another one search() for search option, in which we should pass the search string as the url parameter and filter the results retrieved from the database. Now create a file named ‘pagination.php’ inside ‘application/controllers’ folder, copy paste the below code and save. As you can see we have used a view file ‘pagination_view’ in the controller functions, this we will create in the next step. Note: This code integrates Twitter Bootstrap Pagination classes with CI pagination which is completely optional. The details about integration part are already covered here, so I won’t be repeating it now. Here comes the final step. 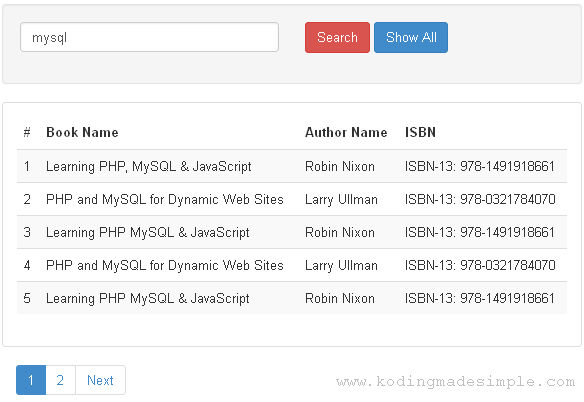 We need to create a user interface that contains a search form, html table structure to display the books info fetched from the database along with pagination links towards the end. For view, create a file named ‘pagination_view.php’ inside ‘application/views’ and copy paste this code. That’s it! 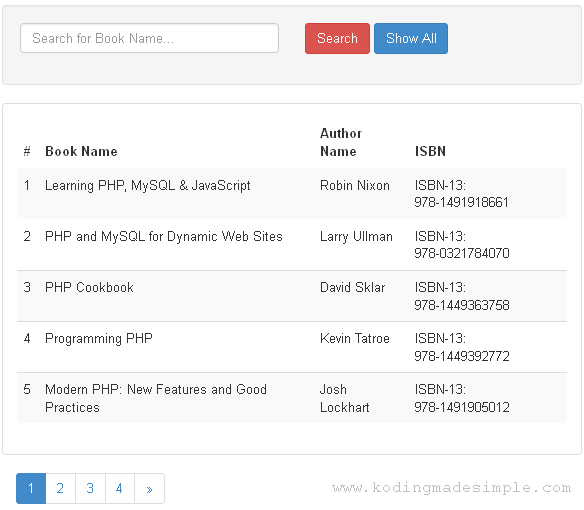 Now run the controller in the browser and you can see several books details listed with pagination links along with search query option at the top. Now type whole/part of a book name and all the books containing that particular search string in their name will be filtered & displayed like this. I found this code only query English variable, So I provide a function. This function allows CodeIgniter url can get ohter language variable. It should be ceil or floor ? can you give downloadable tutorials?? can u post a downloadable tutorial? It doesn't open the next search when you click on the pagination number,It converts the url to % format if there is a space in the search term. this is best but my problem is i remove the index.php using .htaccess file its giving error while using pagination object not found. can you please give me solution for that. it's very good help for me. Can u help more? how the search button r work ?